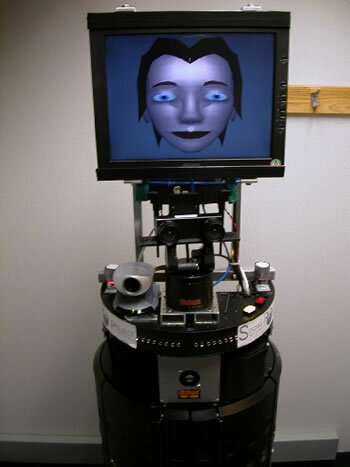 GRACE is a robot created by researchers from Carnegie Mellon, the Naval Research Lab, Swarthmore College and others to enter the AAAI Robot Challenge of 2002. The challenge was that the robot should attend the conference and deal with the human beings it encountered. The robot will also be featured at the 2004 AAAI conference, held at the end of July in San Jose. GRACE, which stands for Graduate Robot Attending a ConferencE, is a B21R Mobile Robot build by RWI. It has a panning platform on which a screen shows an emotionally expressive face, as well as sensors to help it move through crowded environments, including touch sensors and a scanning laser range finder. GRACE has high-quality synthesized speech and can understand others using speech recognition software. At the 2002 conference, GRACE started at the front door of the conference venue, found the elevator by asking participants and made her way to the registration area. GRACE tried to find the end of the line, finally elbowing the end person in the line out of the way (either because it was unable to tell if the person was in fact in line, or because it didn't want to wait!). GRACE then waited patiently and registered successfully. SF fans (and many others) will of course remember socially adept C3P0, the droid from Star Wars that specialized in etiquette and protocol. I'll bet GRACE could pass the test of human-robot interaction implied in the text passage provided in the above link. From Interactive social robots to participate in AAAI's Annual Mobile Robot Challenge.